Sally Melville is such an amazing knitter. She always has a new, clever idea. This time she came up with a technique she calls knit-weave and to demonstrate this technique she designed a hat!! Won't this hat make a great winter accessory? I just read that the Farmer's Almanac is predicting a very cold, stormy winter. Why not knit one for yourself or someone on your gift list so you are ready when the temperature starts dropping!! You need 1 skein of Mountain Colors Moguls and 1 skein of Mountain Colors 3-ply wool. They can be in the same colorway or in two different colorways. And the BEST part is the hat is completely reversible. Sally asks that you please where the hat straight across the forehead at about your eyebrows! I really like this hat, but I would like to know a little more about before I buy it. Is it knitted and if so can this hat be knitted on circular needles, etc. 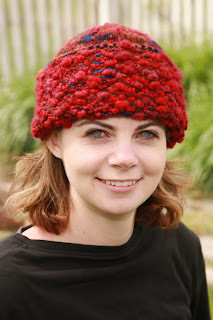 This hat is knit using circular needles and double pointed needles! The double points are just at the very top when it gets really small...you could do magic loop also.